(Nanowerk News) Researchers at the Department of Energy's Oak Ridge National Laboratory have developed a new method to manipulate a wide range of materials and their behavior using only a handful of helium ions. The team's technique, published in Physical Review Letters ("Strain doping: Reversible single axis control of a complex oxide lattice via helium implantation. "), advances the understanding and use of complex oxide materials that boast unusual properties such as superconductivity and colossal magnetoresistance but are notoriously difficult to control. 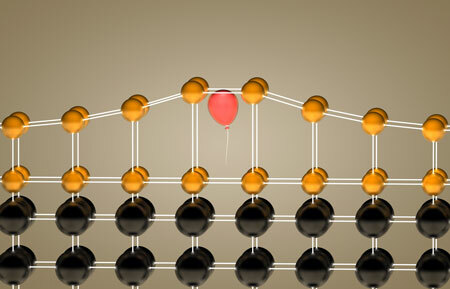 Inserting helium atoms (visualized as a red balloon) into a crystalline film (gold) allowed Oak Ridge National Laboratory researchers to control the material's elongation in a single direction. The intricate way in which electrons are bound inside complex oxides means that any strain -- stretching, pulling or pushing of the structure -- triggers changes in many different electronic properties. This ripple effect complicates scientists' ability to study or make use of the finicky materials.